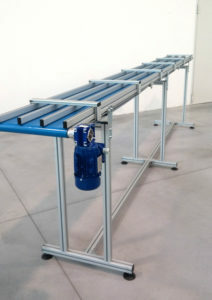 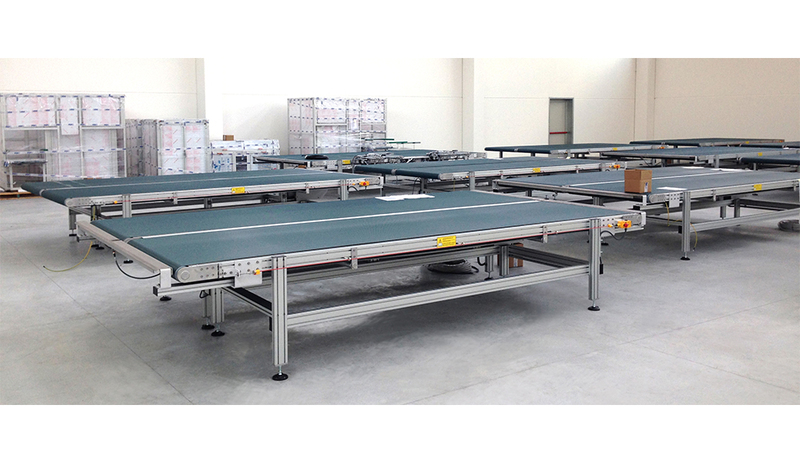 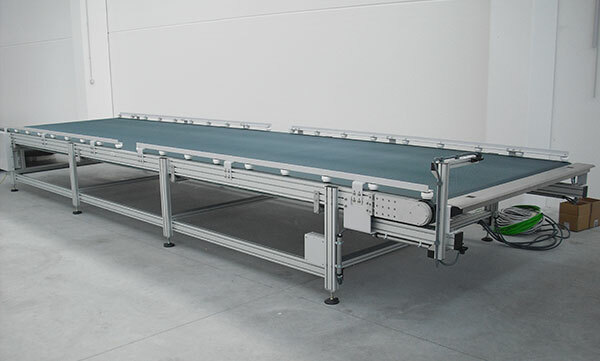 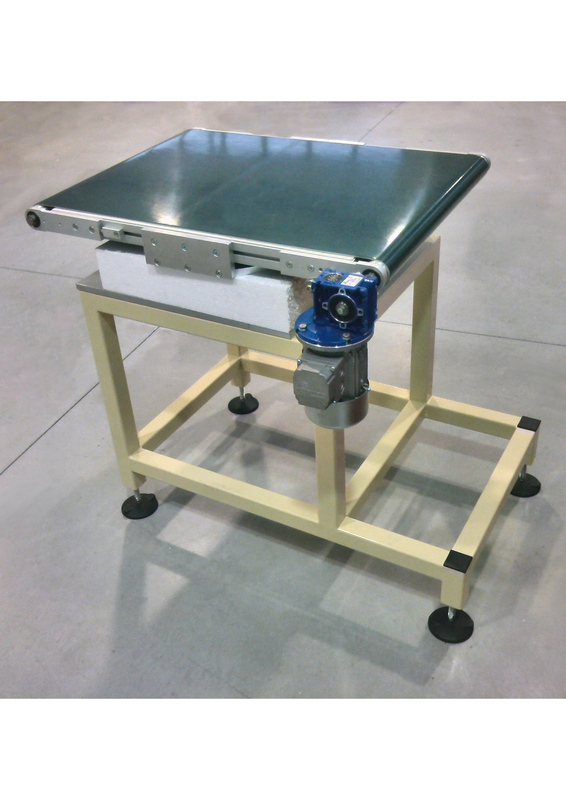 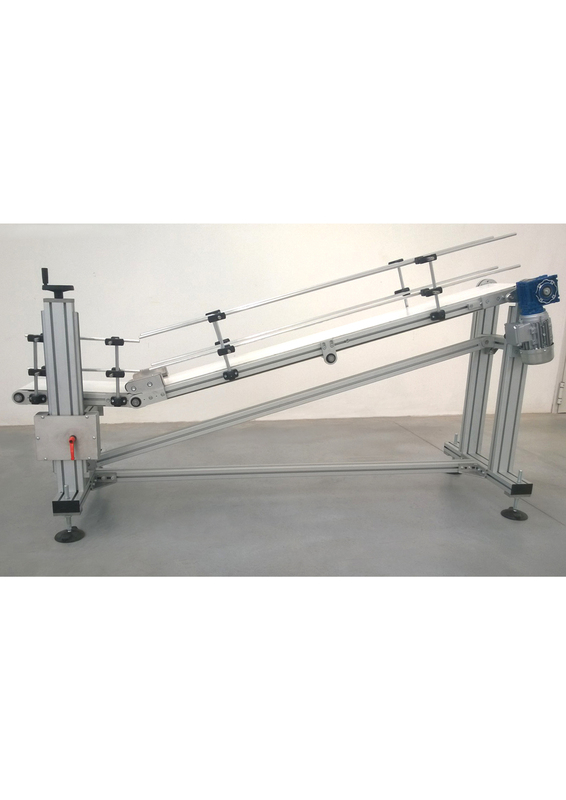 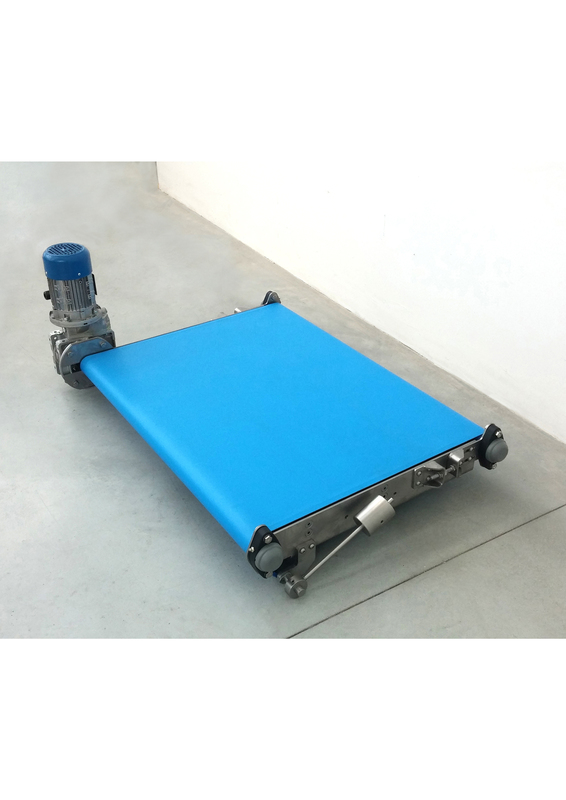 Conveyor belts are devices used to move objects or materials of different types and sizes. 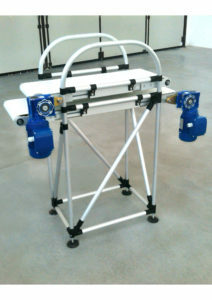 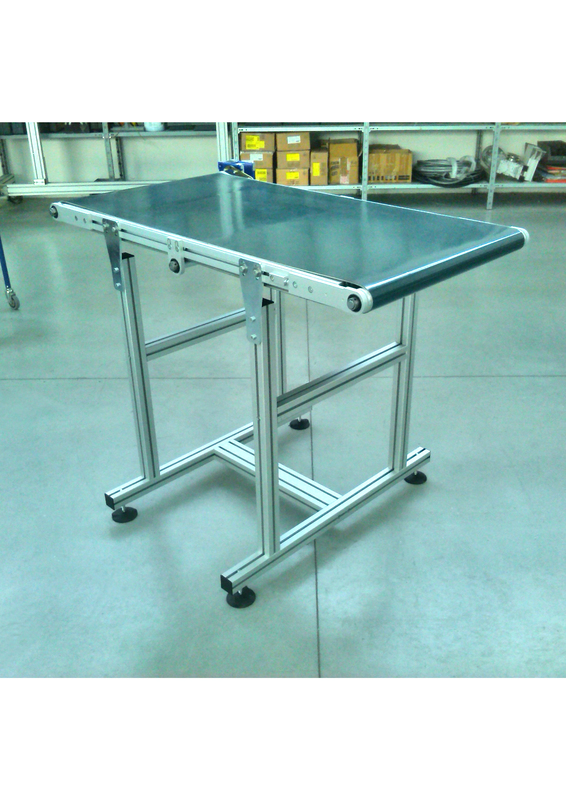 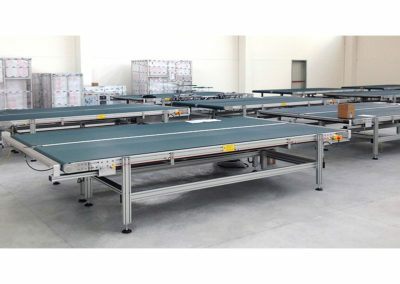 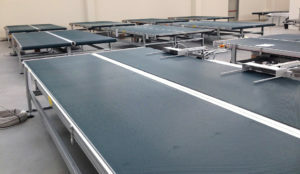 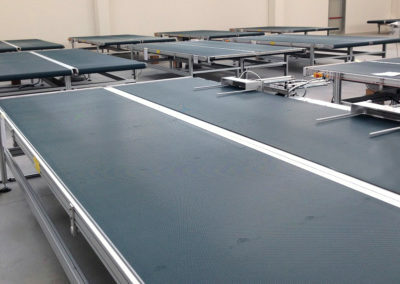 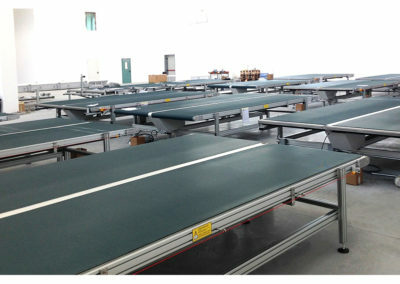 In fact, our projects adapt to any need, starting with the type of product, the speed and weight of the load. 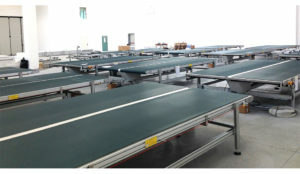 The sectors of use are: the packaging, food, pharmaceutical, textile, wood and mechanical industries. 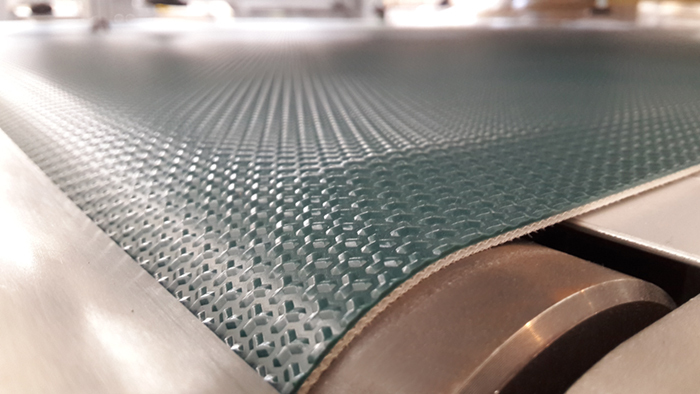 The essence of our technical knowledge combined with the high attention to materials and aesthetic impact is perfectly achieved in the Conveyor Belt line. 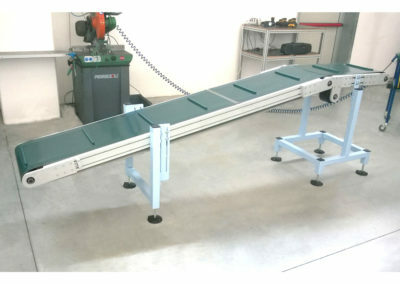 The conveyor belts are made in aluminum profile and / or in painted and stainless steel, depending on the applications and needs. 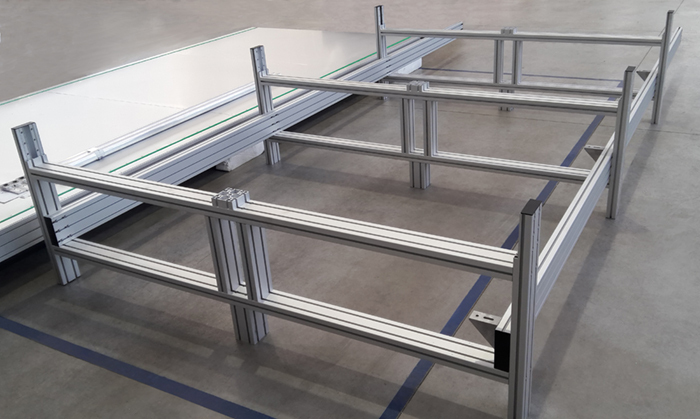 Why choose an aluminum structural profile? 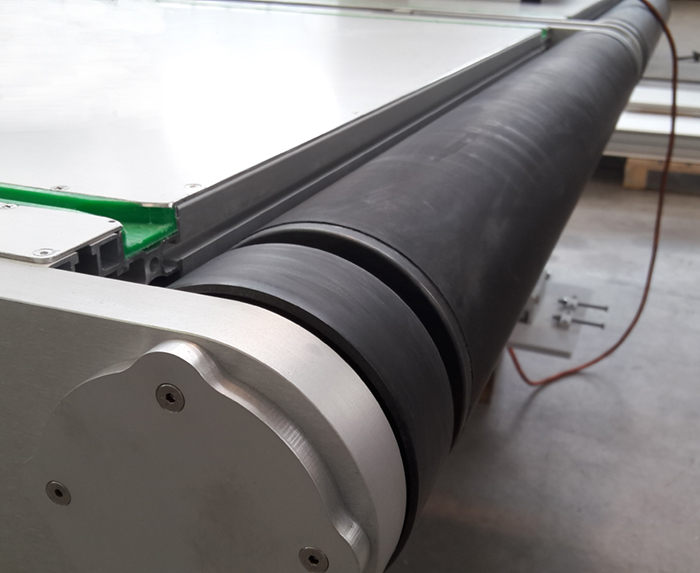 Because the Milper System with aluminum profiles allows the construction of structures with modular characteristics, with the possibility of creating special high performance conveyor belts. 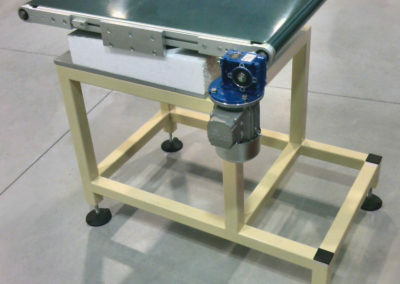 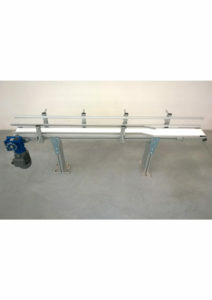 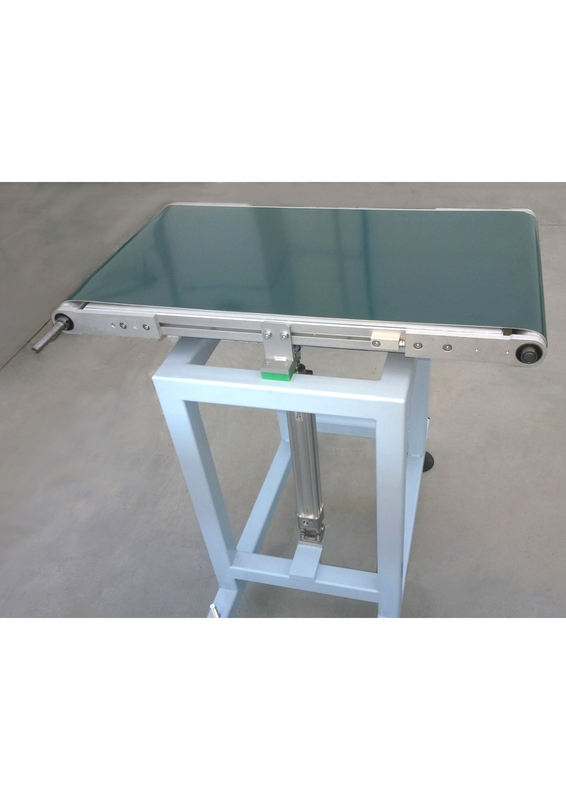 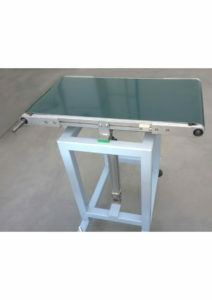 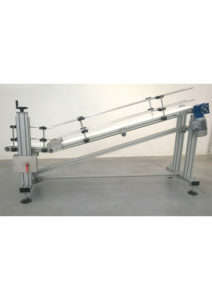 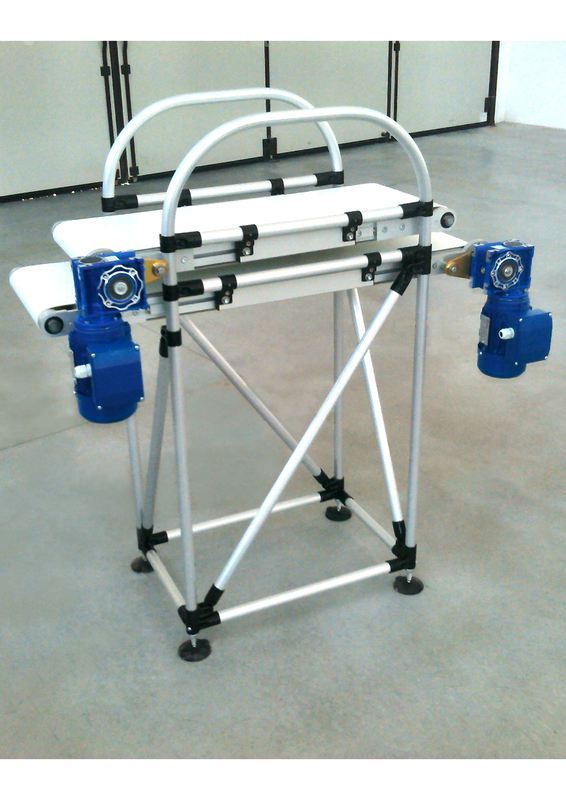 The rollers are made of aluminum with dedicated extrusions or of steel. 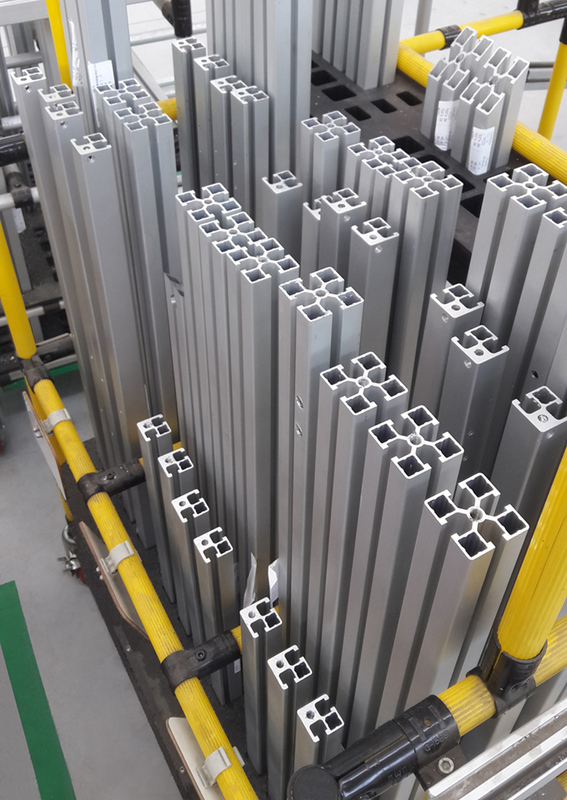 Production is carried out entirely by Milper Steel (Milper Group Business Unit), guaranteeing the excellence of the service and proposals to our customers. 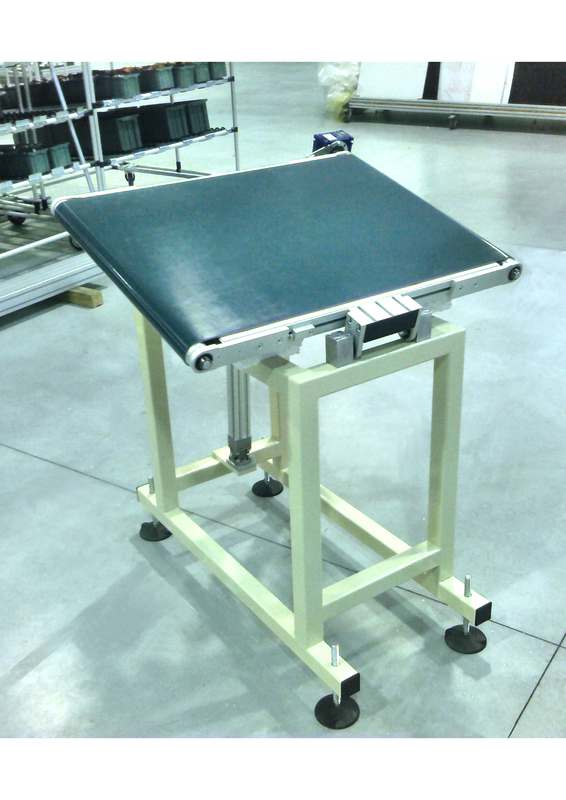 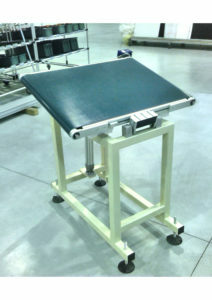 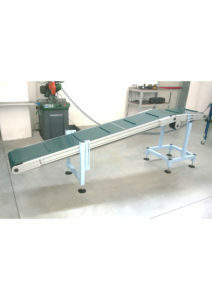 We use the best Made in Italy products for the conveyor belts. The choice of the canvases passes through a careful evaluation of the products to be handled. 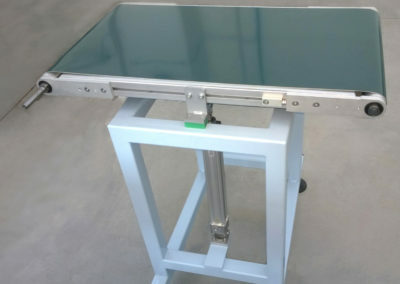 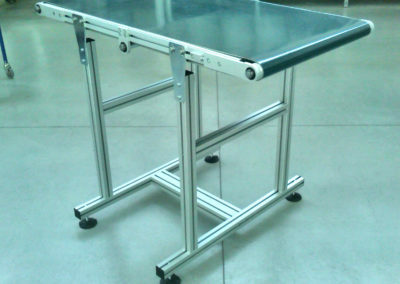 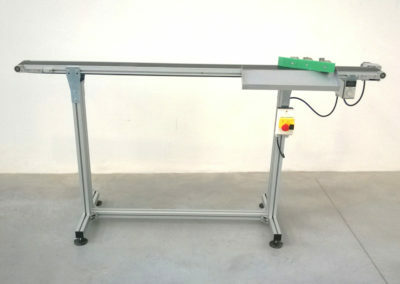 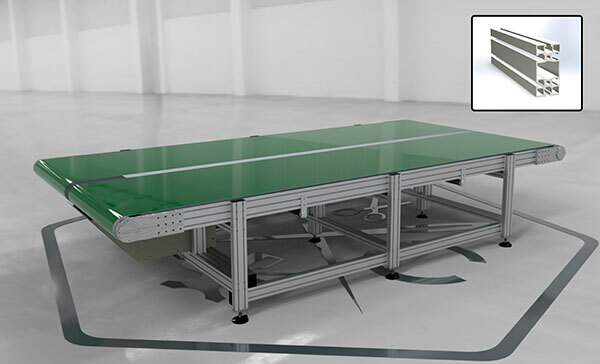 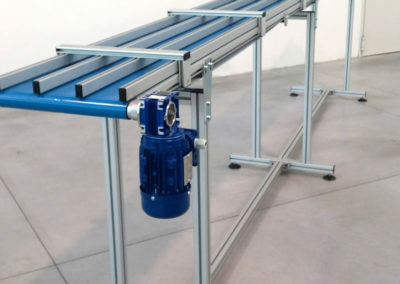 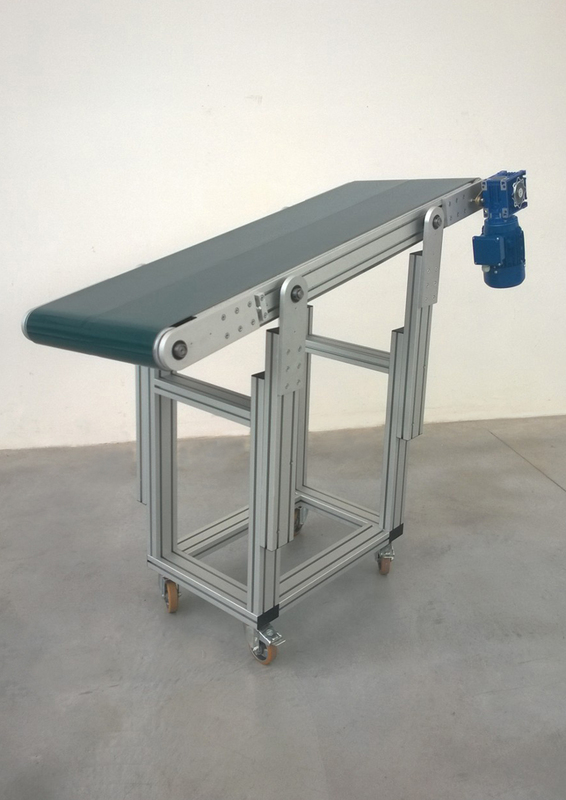 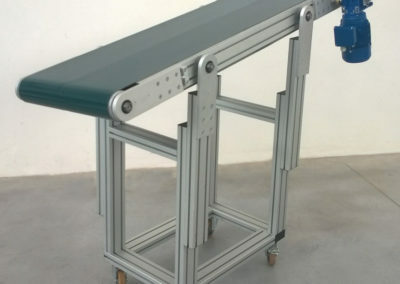 The presence of slots on the Milper system’s aluminum structural profiles allows the application of accessories on the conveyor belt, such as sensors, special tires, side rails, safety guards, etc. 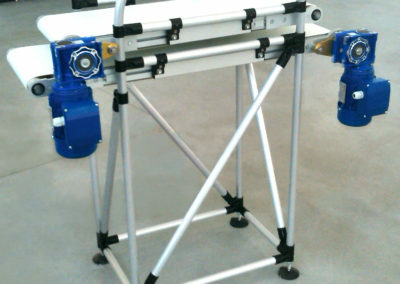 Furthermore, by using the square threaded nuts, applicable at any point, it is possible to obtain repositionable anchors along the entire length of the slots. 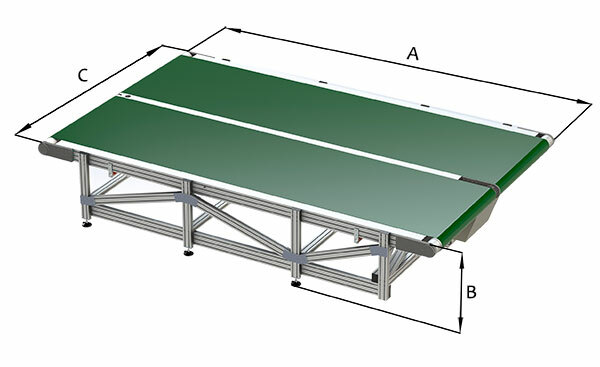 These features make the tapes more functional and customizable. 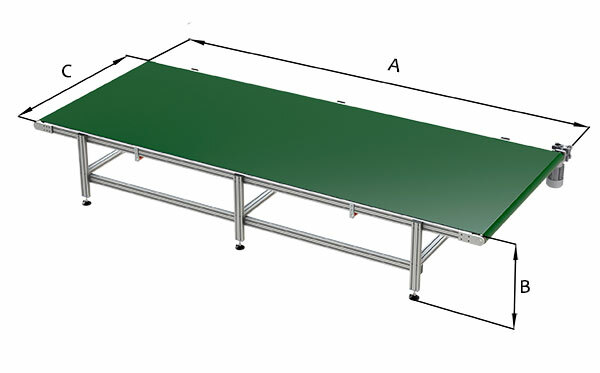 Is it possible to use a light metal to move heavy loads? 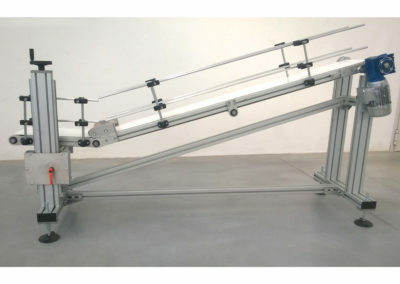 For us it’s possible ! 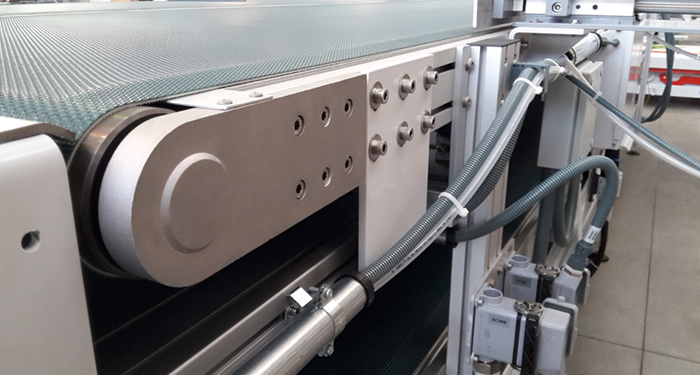 Our Research & Development Department, since 20 years, proposes the application of aluminium profiles to manufacture conveyor belts for heavy loads. 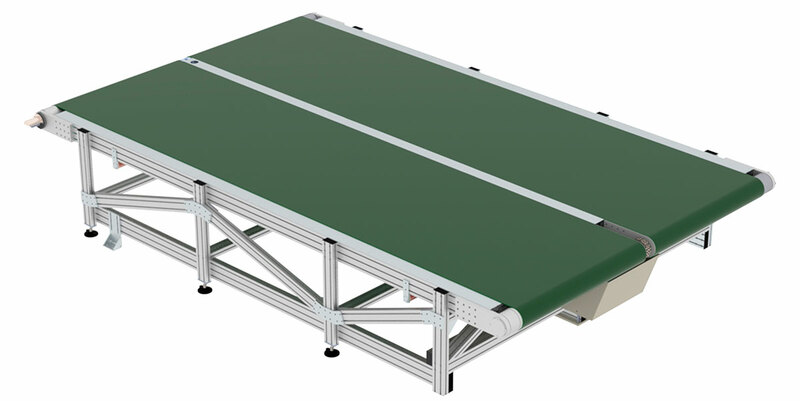 Unlike STEEL, more common for the moving of heavy loads, ALUMINIUM gives the possibility to create special products with high performances. 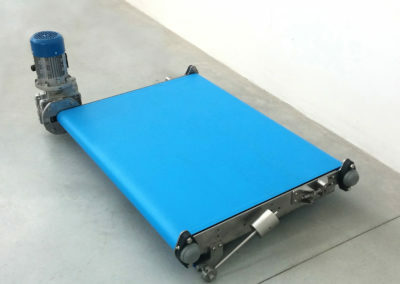 From this case history are born heavy conveyor belts with the exclusive rollers diameter 140mm, 160mm, 180mm. 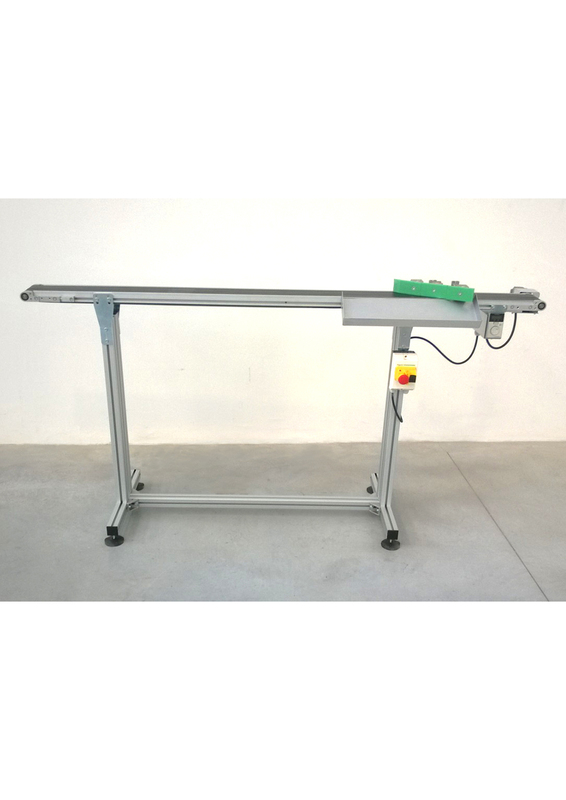 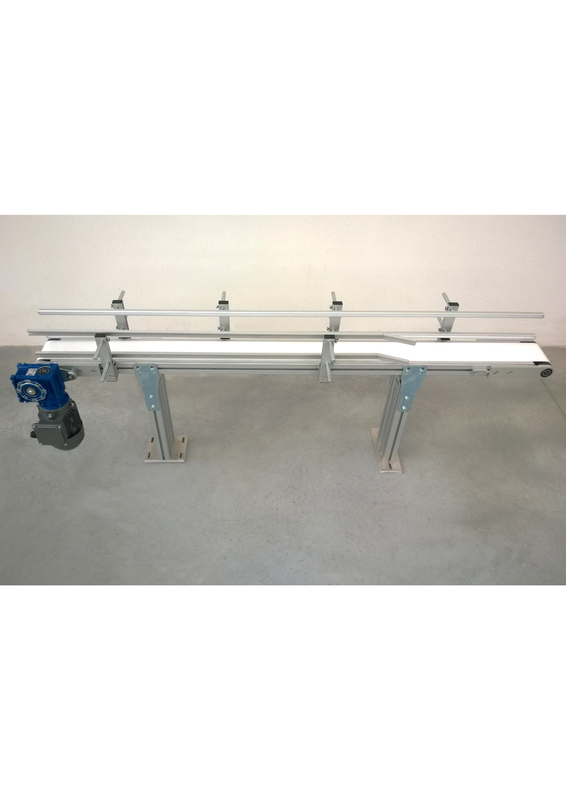 In this case history we have created a conveyor belt for the receipt of bags coming out of a metal detector with variable height. 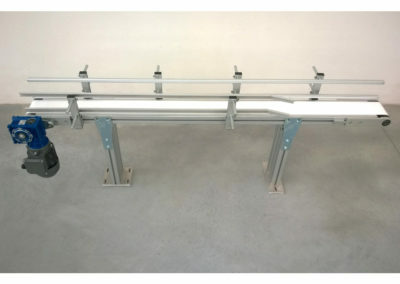 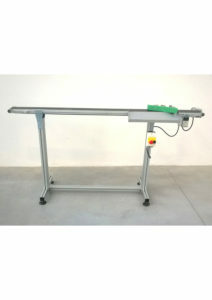 The structure consists of a 400mm long flat section and a 1500mm long inclined section. 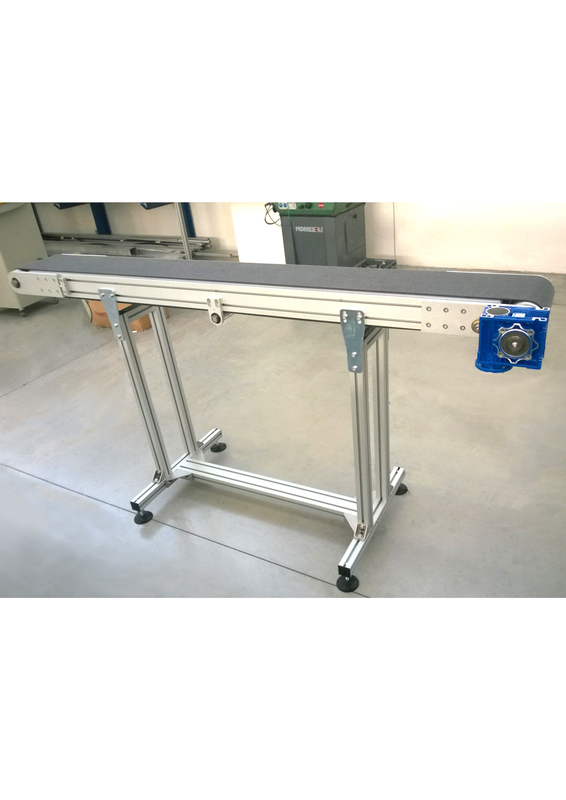 The main feature of this belt is that the flat part is adjustable in height with the use of a linear unit. 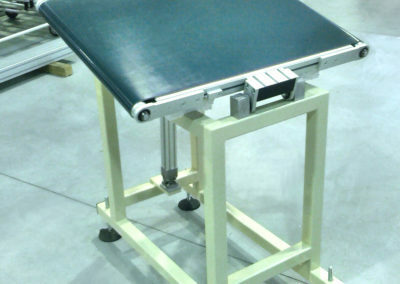 Moreover, unlike standard belts that present 4 supports, we removed one from this structure. 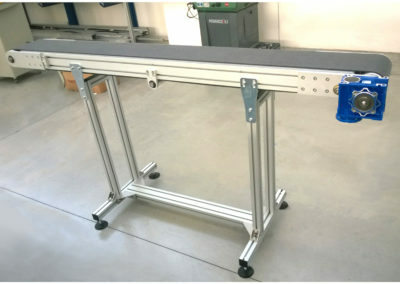 The customer needed, in fact, to have more space for the receipt of the bags and to optimize the size we have studied a solution that could maintain a correct balance with only 3 supports.